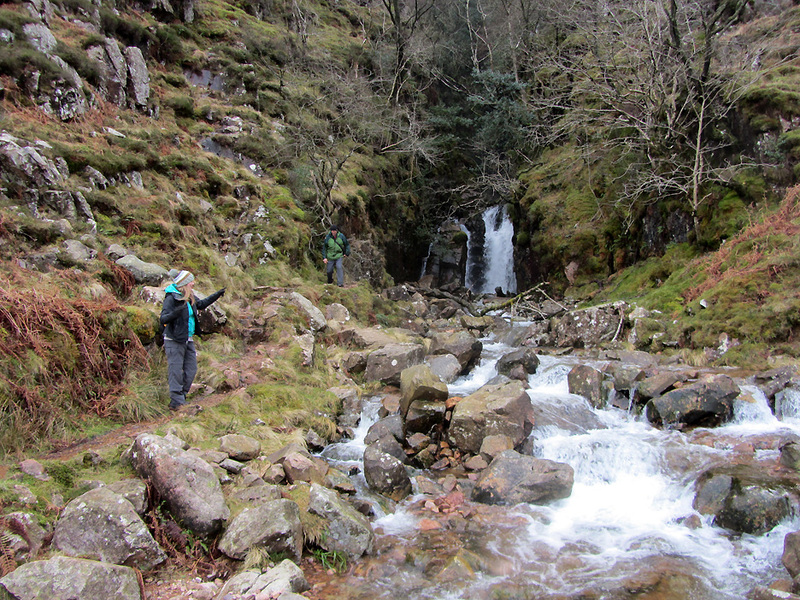 " Scale Force with Jenna "
Date & start time: Tuesday 9 th February 2016, midday start. 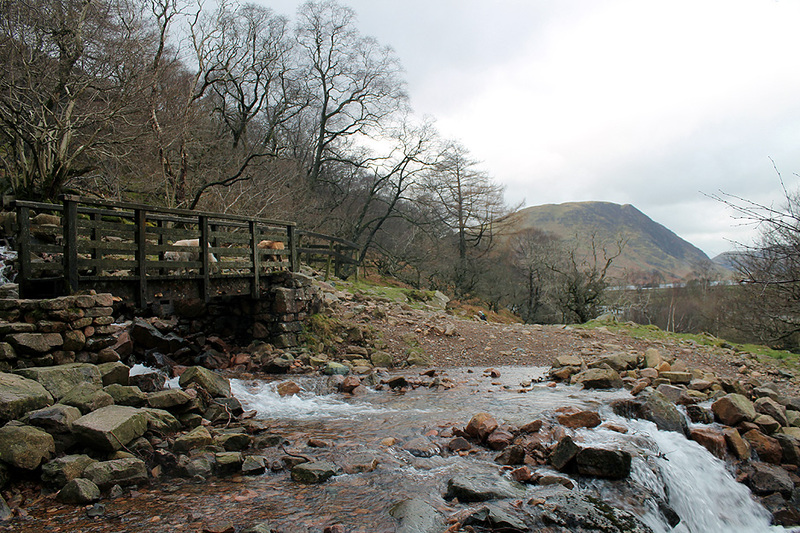 Places visited : Buttermere, Scales Bridge, Scale Force and back via Sour Milk Gill. 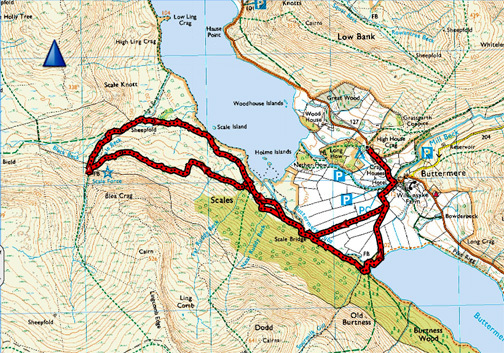 Walk details : 4.8 mls, 500 feet of ascent, 3 hour 20 mins. 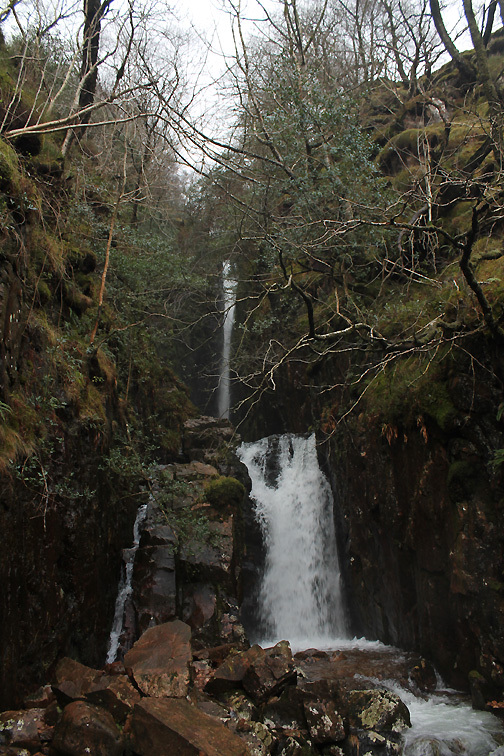 Highest point : Scale Force Waterfall, 1275 ft - 392m above sea level. 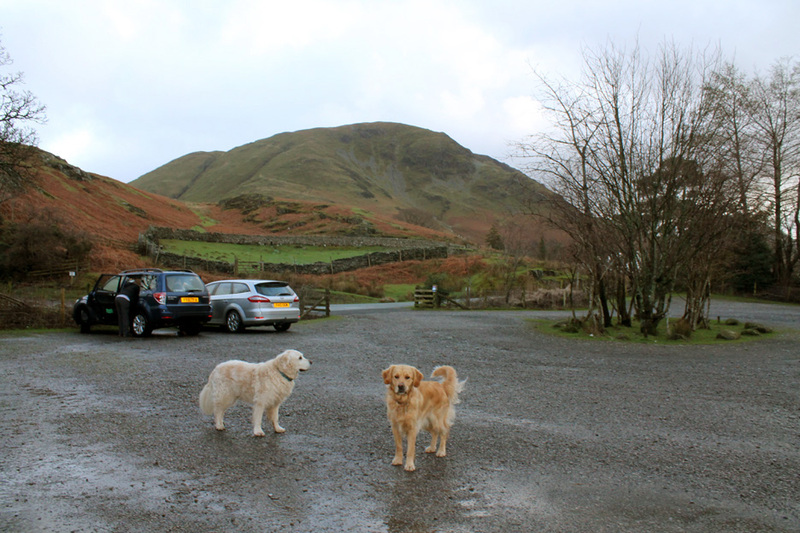 Walked with : Jenna, Ann and our dogs, Harry and Dylan. 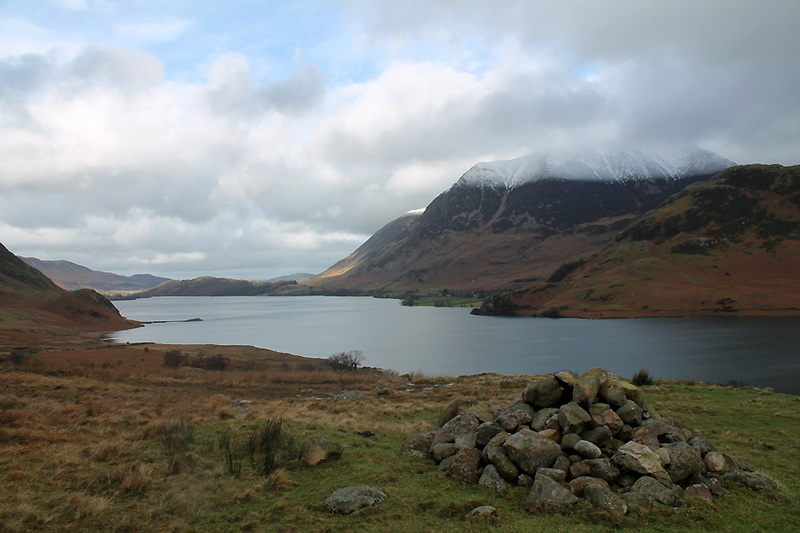 Weather : Some blue skies and sunshine but cloud over our high fells keeps us in the shade. Thankfully reasonable weather is becoming more frequent and this spell has coincided with our daughter's arrival over her half-term. 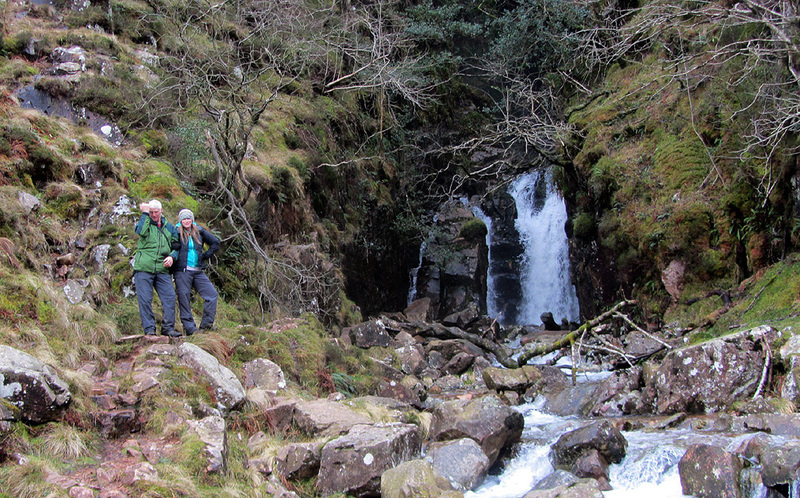 The recent rains are still causing high water levels in the valley so a trip over to see the waterfalls seem a good idea. Hopefully Scale Force should look quite impressive. 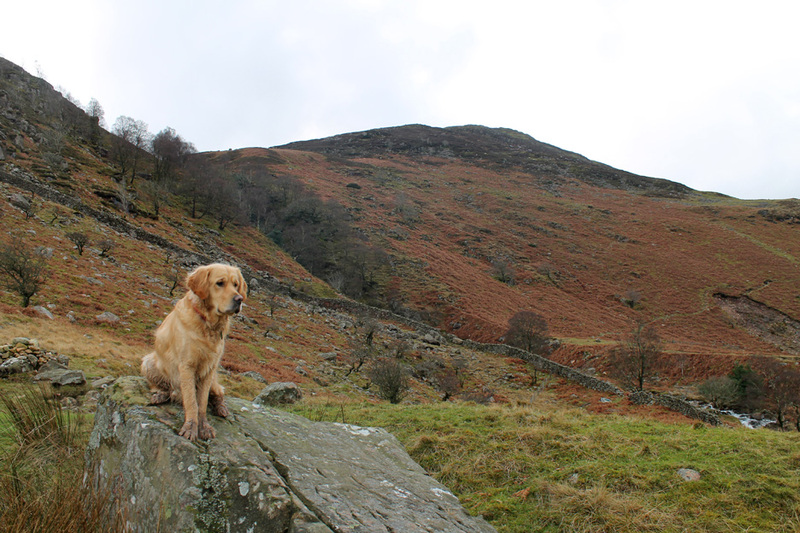 Same start as our last walk but this time we go in a totally different direction . . . 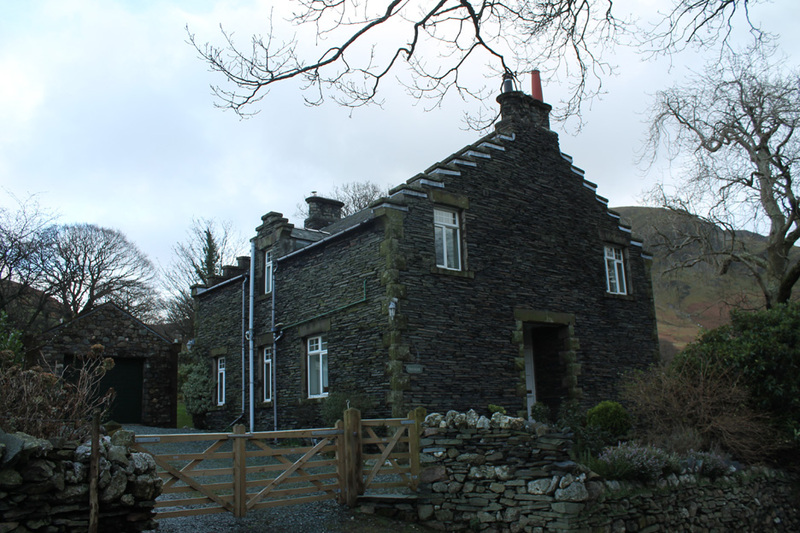 The slate faced house known as Trevine in Buttermere Village. The end of the roof line has a decorative crow-stepped or corbie stepped gable, a 16th Century design feature on a more modern house. Looking more Alpine in character . 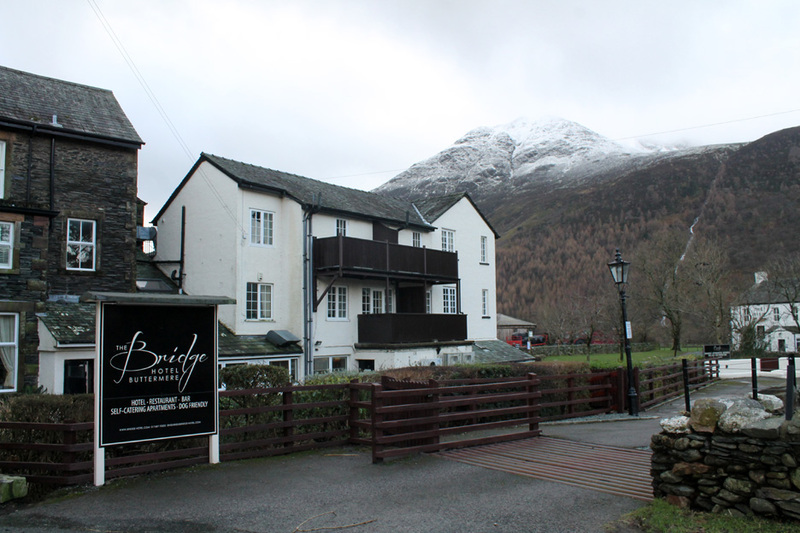 . . the Bridge Hotel Buttermere. 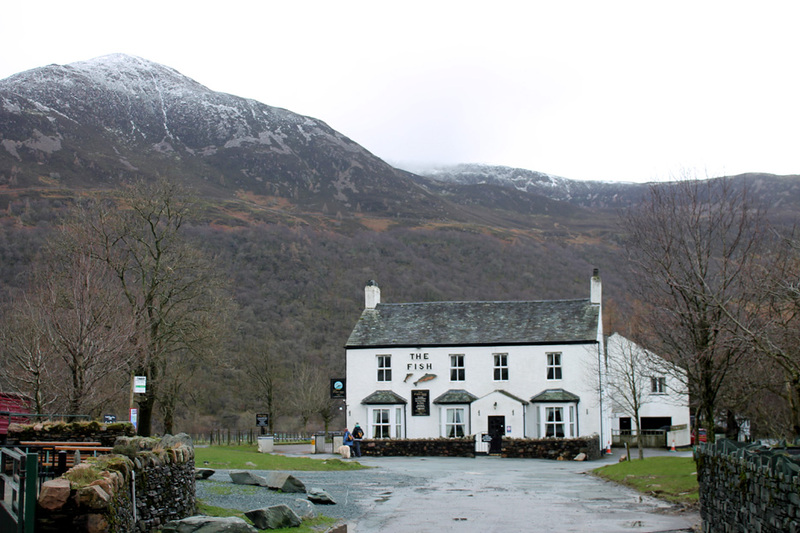 Always good food and drink on offer ! and head across to the other side of the valley. A more traditional, local design is found in the Fish Hotel's outside appearance. 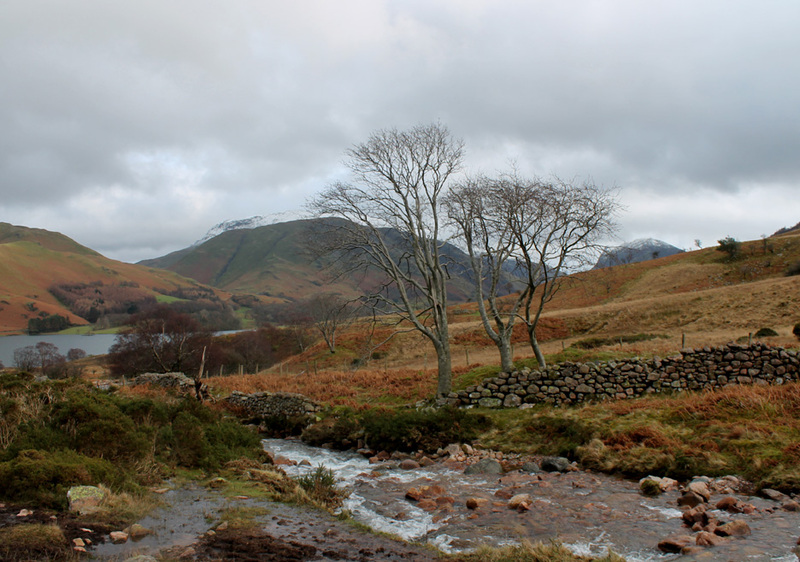 Looking across to the head of the Buttermere Valley. 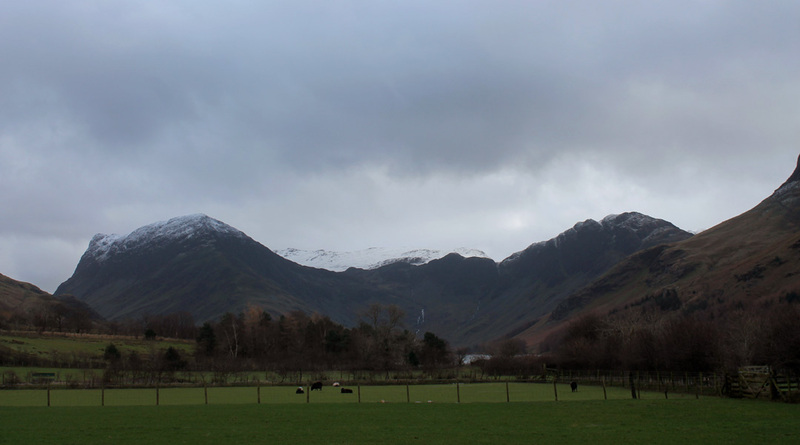 Fleetwith Pike, Brandreth and Haystacks are topped in snow, the others have the snow but a cloud covering too. Hmm . . . hadn't bargained for this . . . 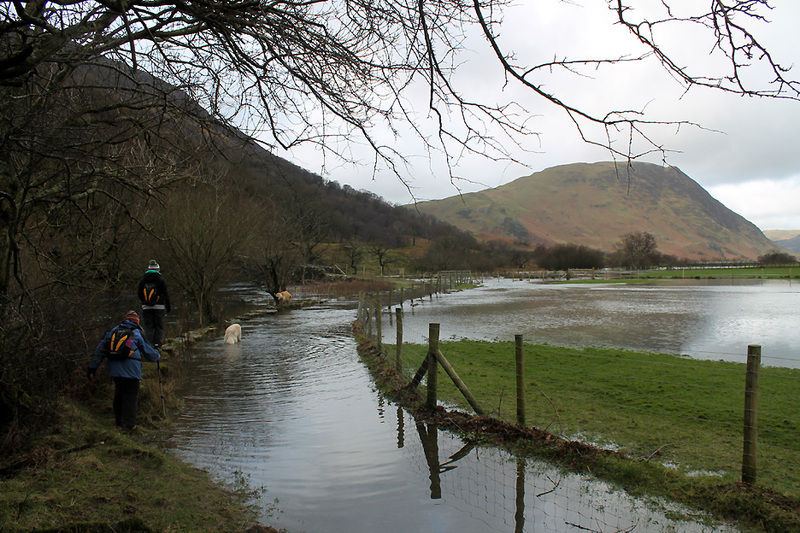 The high water levels in the river have caused it to overflow and flood the track to a depth of at least a foot. Still the track has been outlined by large, flat topped boulders . . . you could even call them stepping stones. Perhaps the water is slightly more than a foot deep. 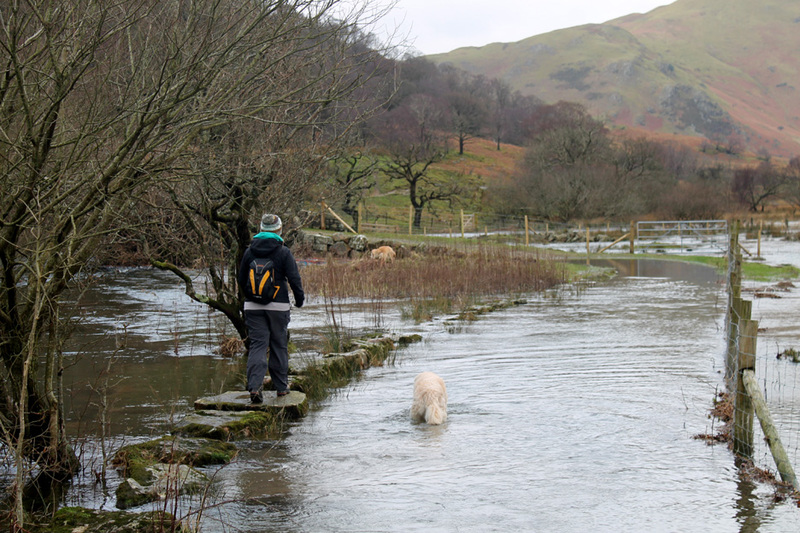 Fortunately the solid stones are still visible under just an inch or so of water so perfectly passable with care. 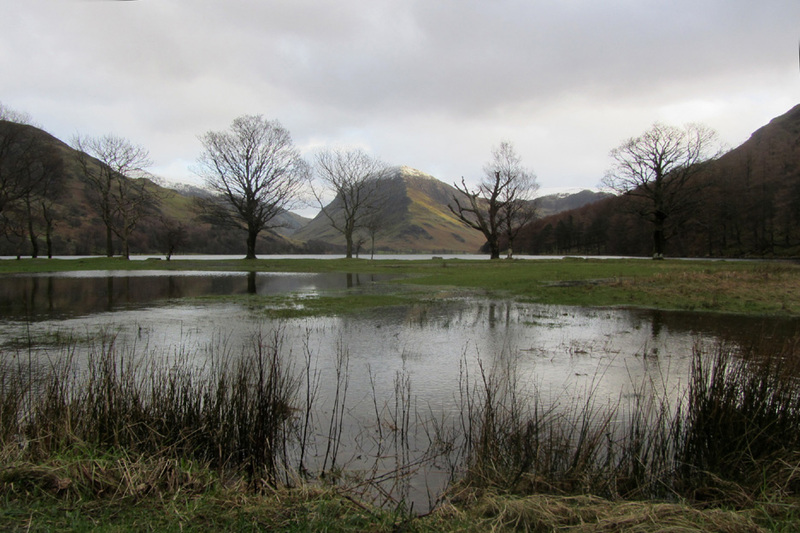 which has presumably floated down from somewhere on the Buttermere foreshore. 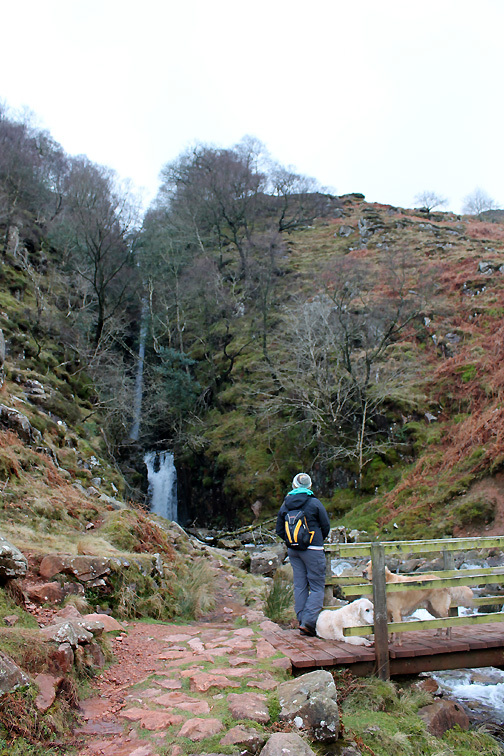 We take the path across the fellside heading for the waterfall. 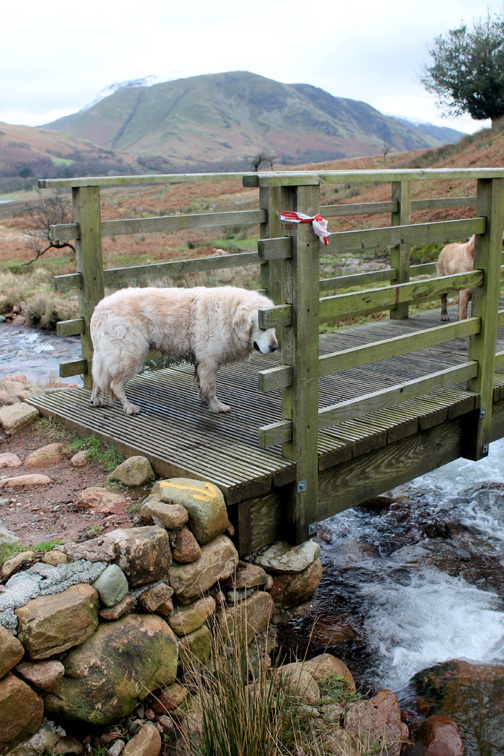 The Near Ruddy Beck (as opposed to the Far Ruddy Beck) has a convenient bridge to save jumping the stream. 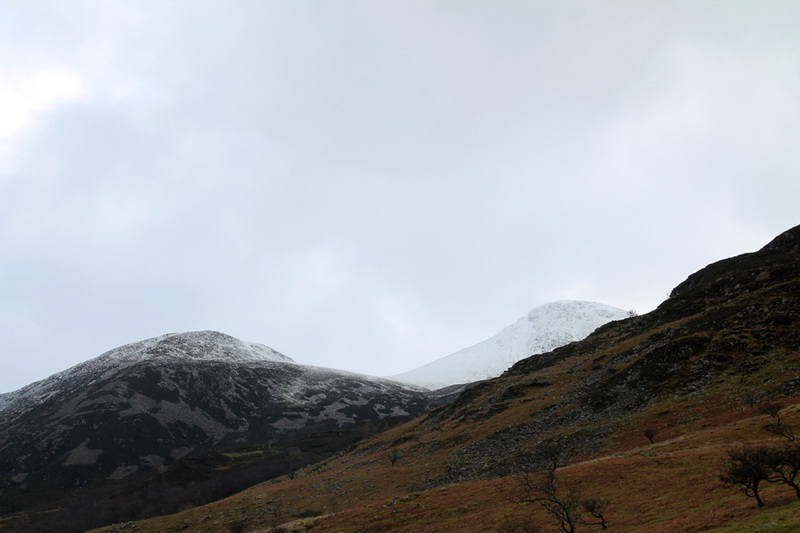 A slight panorama of our route . 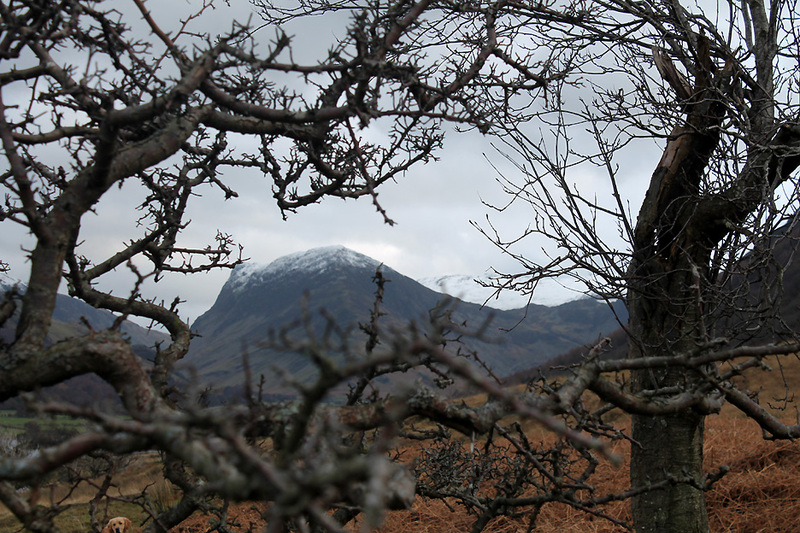 . . walk right to left across the photo and enjoy the view. Mind the wet bits . . . they're slippery ! 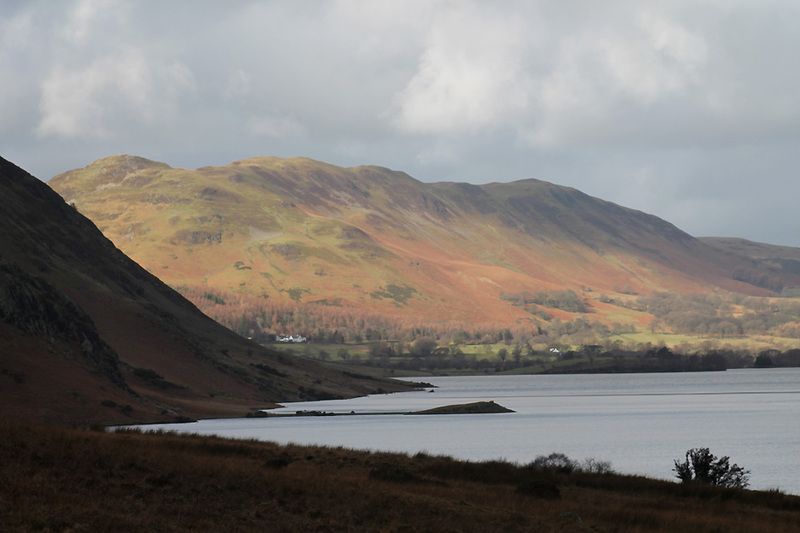 Sunshine on Low Fell but Low Ling Crag that juts out into the lake is in shadow like ourselves. and who knows who will get there first . . . it all depends on the state of the path. A final look at the snow-capped summit of Red Pike before it disappears behind the flanks of Lingcomb Edge. 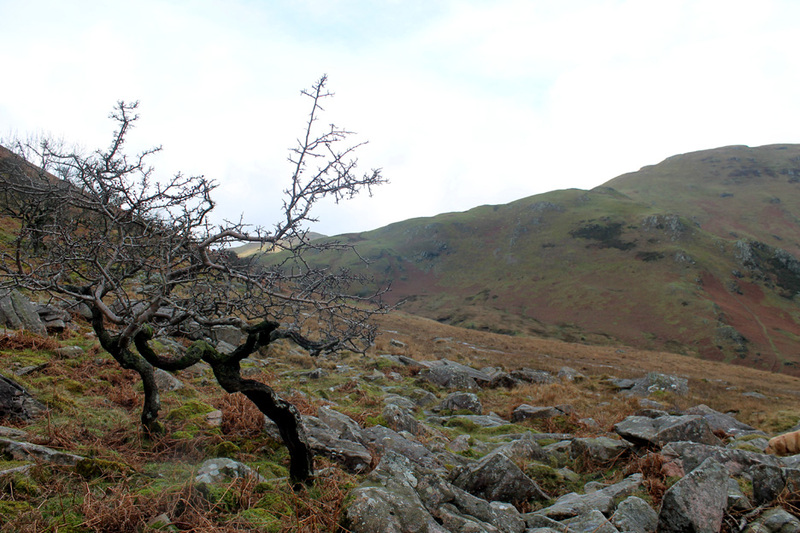 The top path aims to stay above the 'spring line' as indicated by the old hawthorn trees. 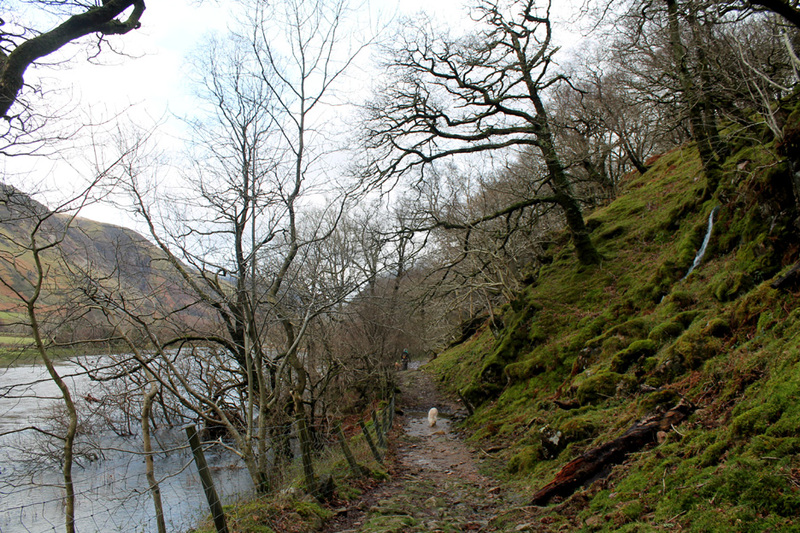 It is, however, a slightly rocky path as can be seen from this photo. One last rock and we're there . . . 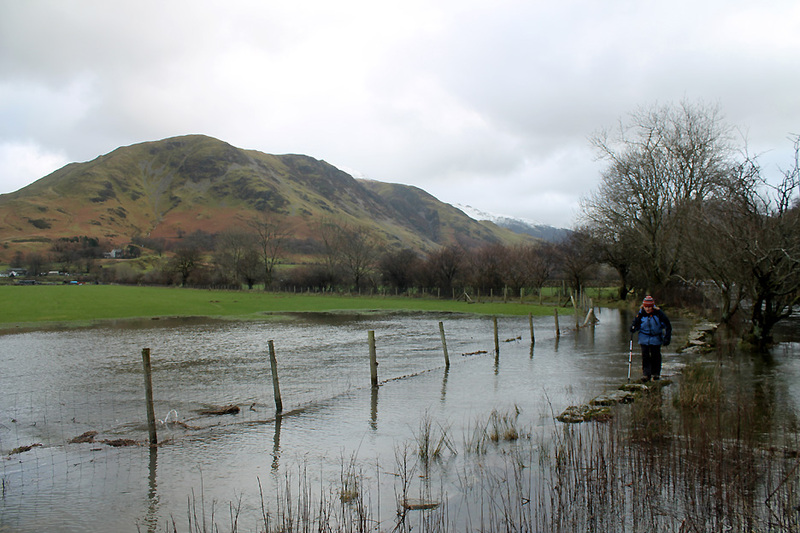 Scale Force is hidden deep in the cleft of the fellside ahead. 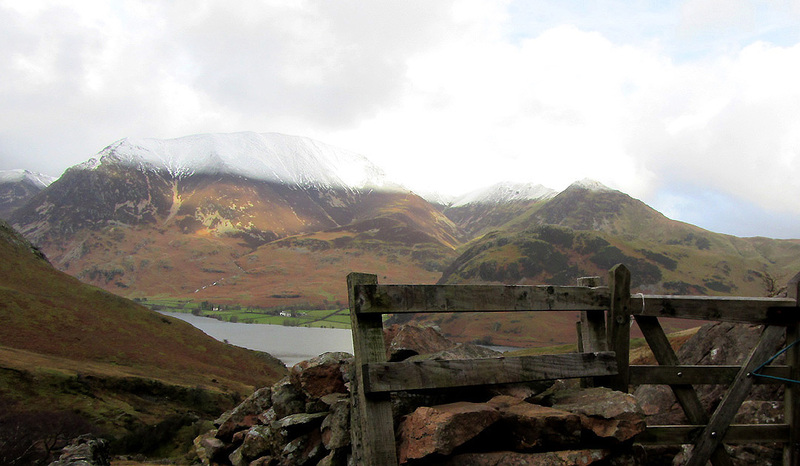 A view back of snow covered Grasmoor and Whiteless Pike from the gate. Through the gate and we're onto the (iron) red steps that lead down to Scale Beck. 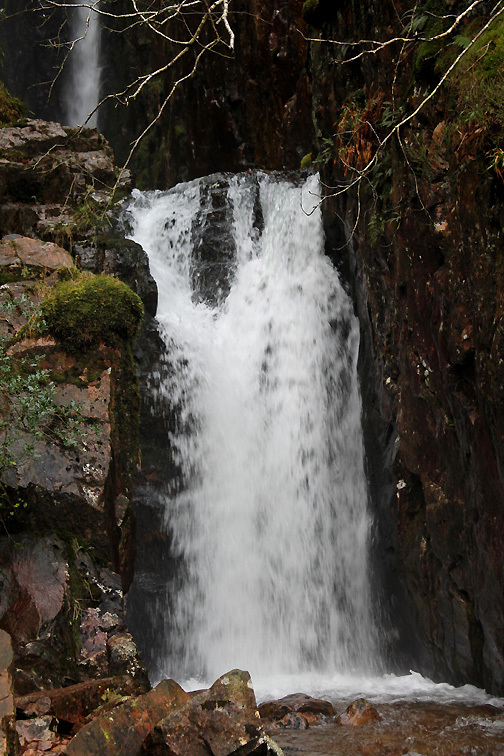 The waterfall resides deep in the ravine . . .
. . . at 170 feet high it is the tallest single-drop waterfall in the Lakes. 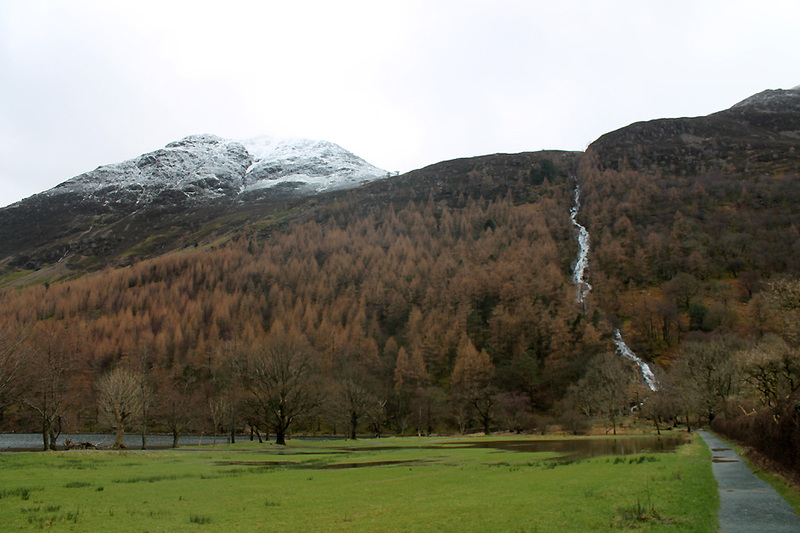 To climb up today would be rather slippery . . . and the ravine full of spray would make it a much less pleasant walk home . . . so no thanks. Plenty of water in the falls, with an extra channel to the left. The lower falls are nearly twenty feet high in themselves. Jenna and I pose for a photo by the lower falls . . . a "Have you taken it yet ?" moment. Time to be heading back as there's no lunch to consume . . . we had a big breakfast not long ago after all. 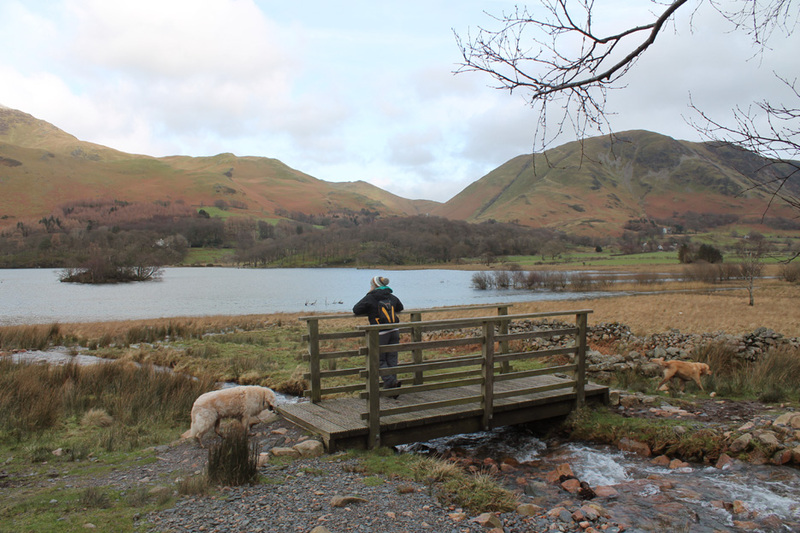 For those that kindly bought our Loweswatercam Calendar . . . this group of trees are "Miss April 2016". 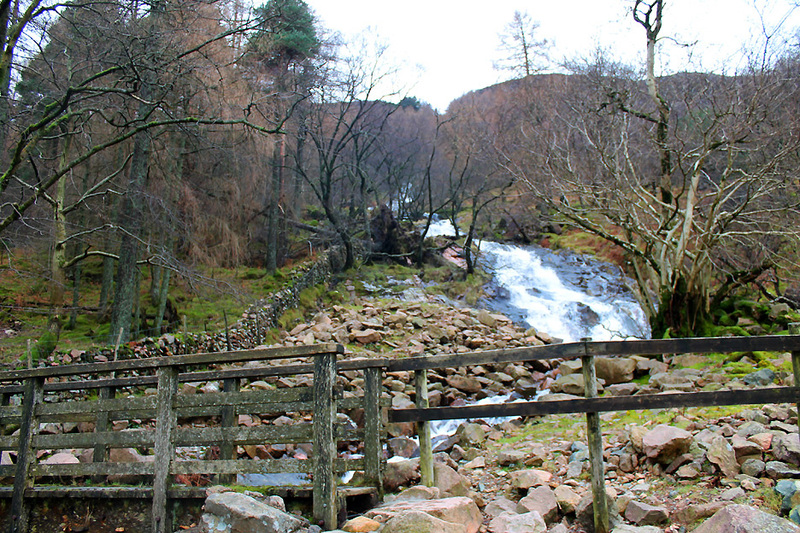 Down to the middle bridge on Scales Beck . . . this will take us back on the lower path. 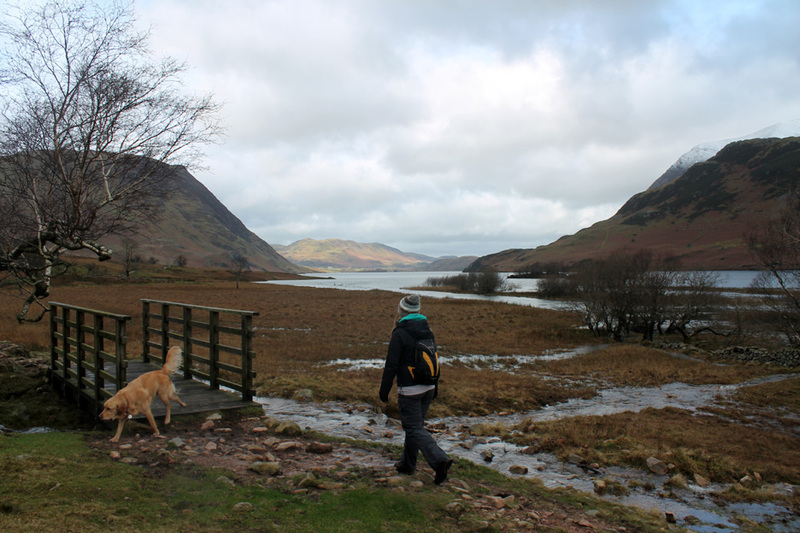 and looking at the map this is in fact the route of the Floutern Pass bridleway that joins the Buttermere and Ennerdale Valleys. but not without slight damage. and now not all water flows underneath the bridge. hence the red tape and yellow arrow. 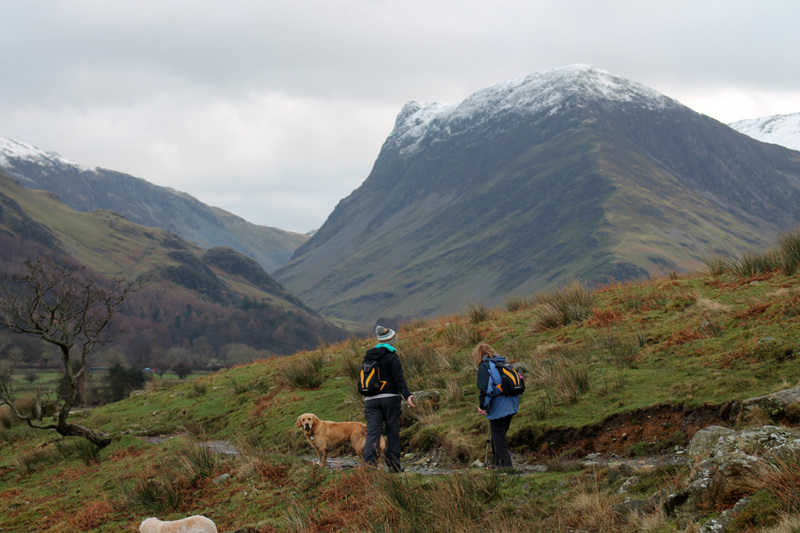 Walking back on a damp path we gain sight of Fleetwith Pike and snow-covered Brandreth again. 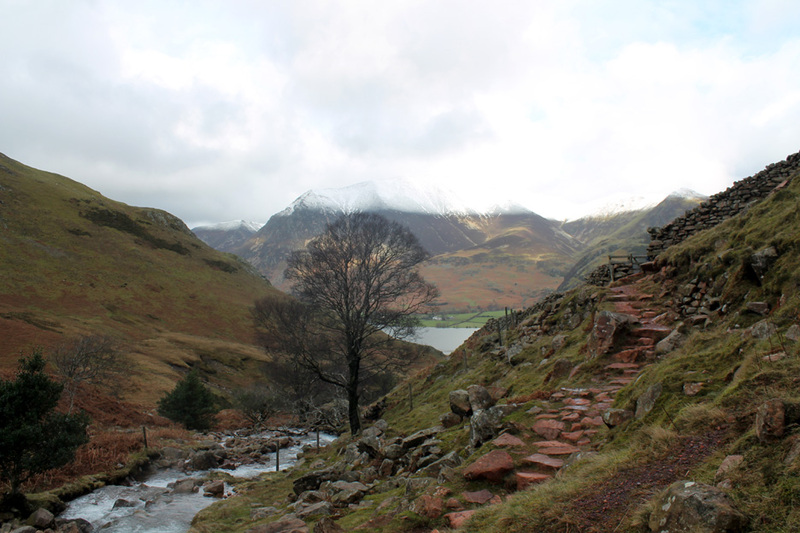 The middle path and lower path meet and with care we head back to Buttermere. 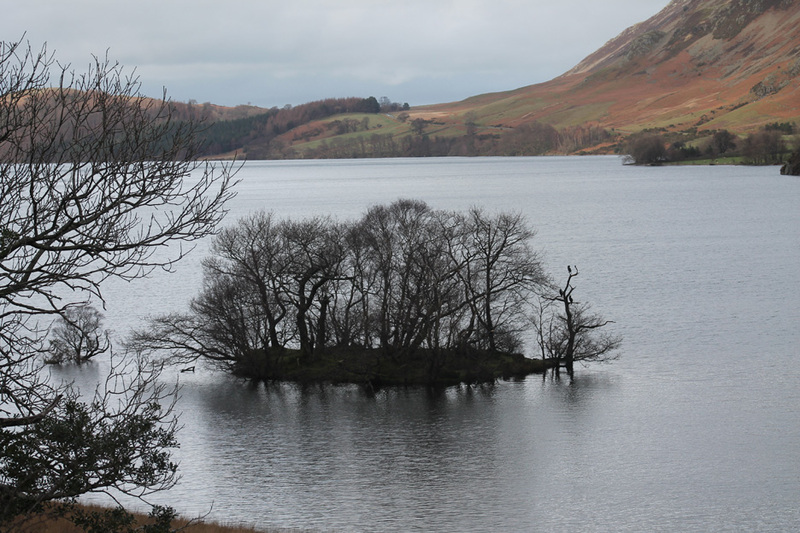 Below us in the lake is Scale Island. 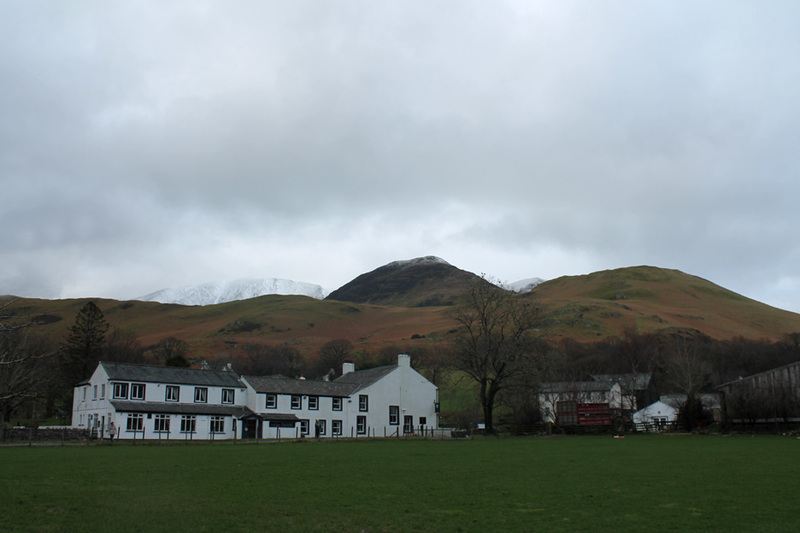 that graze the fell side. Look closely at the tree. 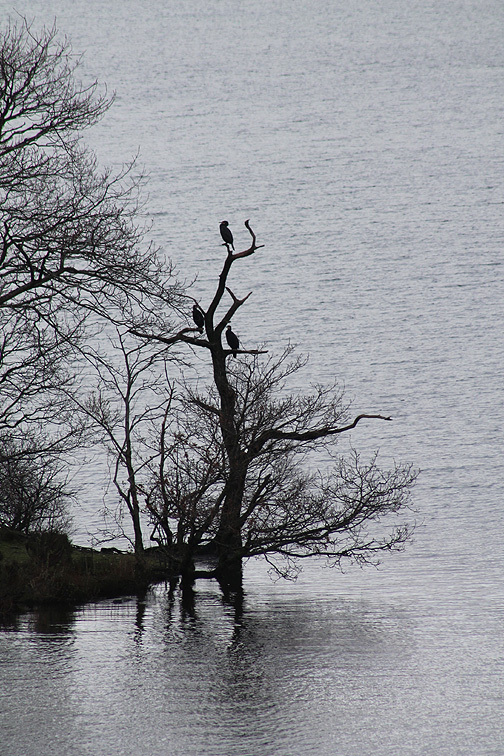 It serves as a great perch for these three shags. [ I may be mistaken with their identity of course. Moving swiftly on . . . we regain a modicum of dry ground. 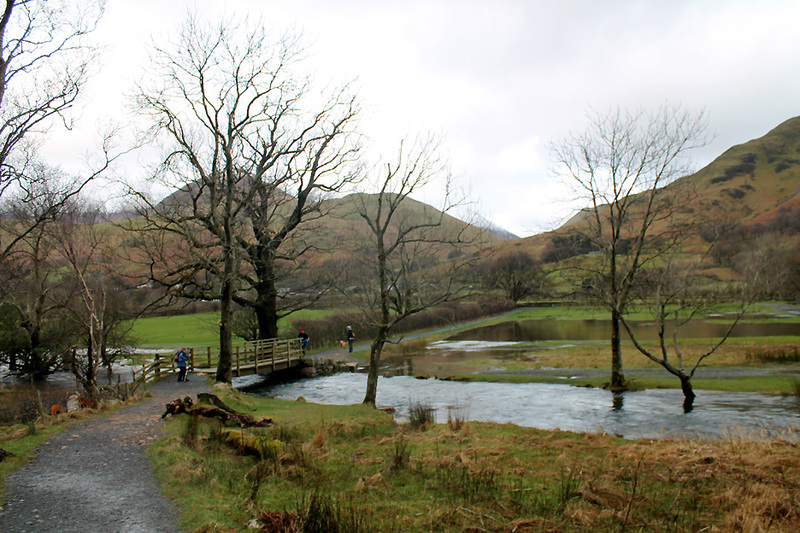 Rather than use the first bridge and the stepping stones we opted to continue on . 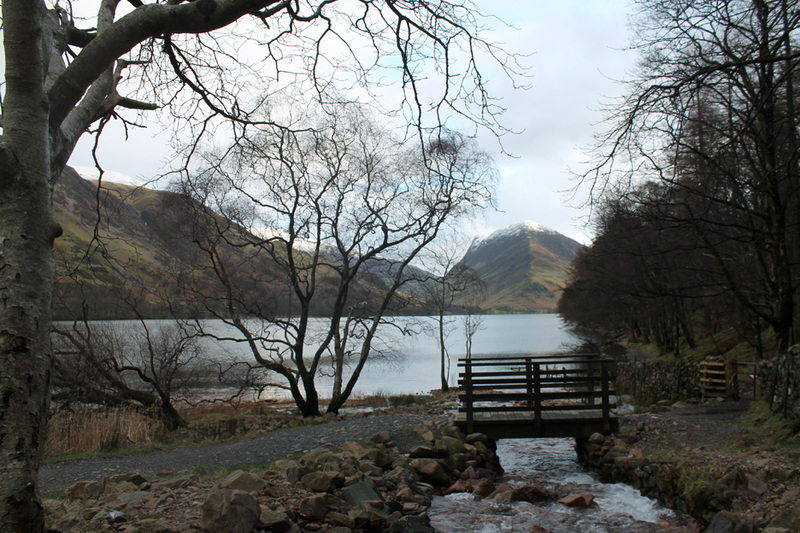 . . to view Buttermere lake itself. 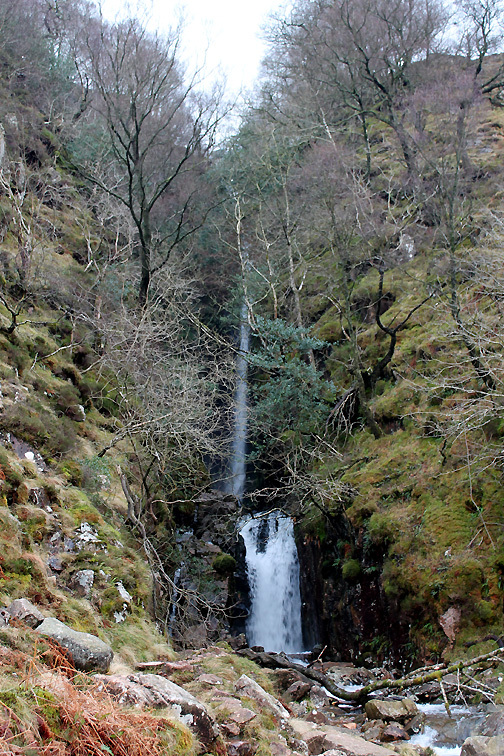 Sour Milk Gill as it roars and cascades down the fellside. The bridge below the falls . . . we didn't actually need to cross it as the path heads right, down and out of the photo. 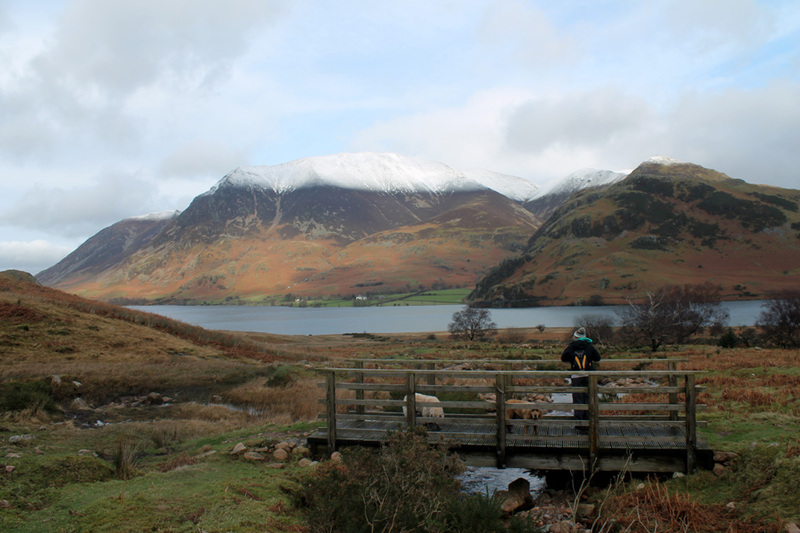 I follow the beck down to catch the classic view of Fleetwith Pike across the length of Buttermere. 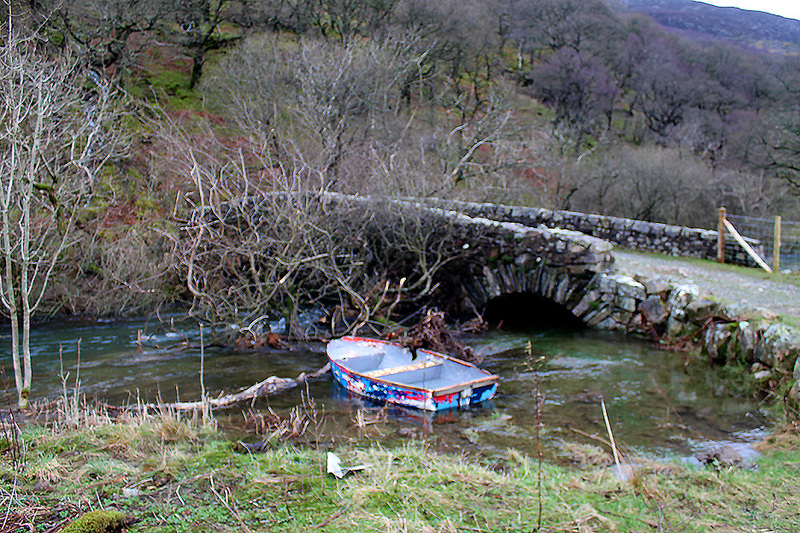 There's flooding down at this bridge too . 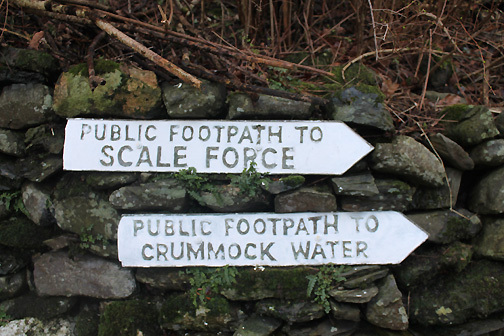 . . but the raised footpath is clear. 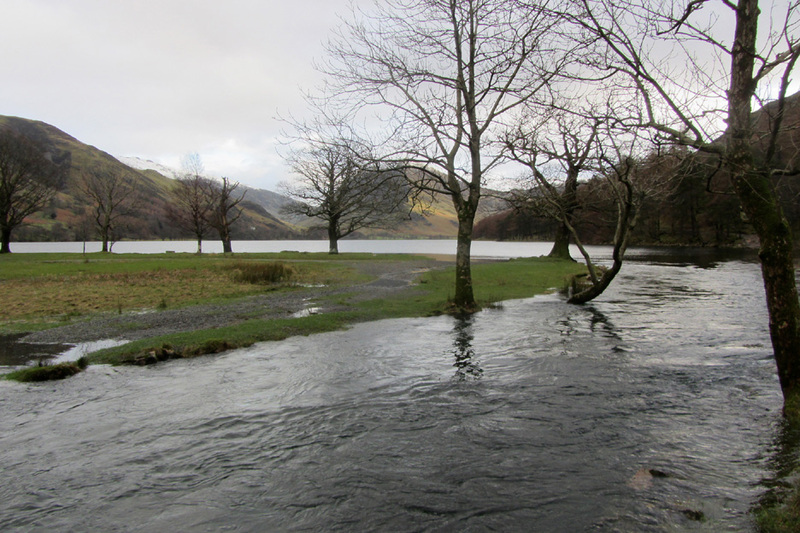 Buttermere outflow is full to the brim. 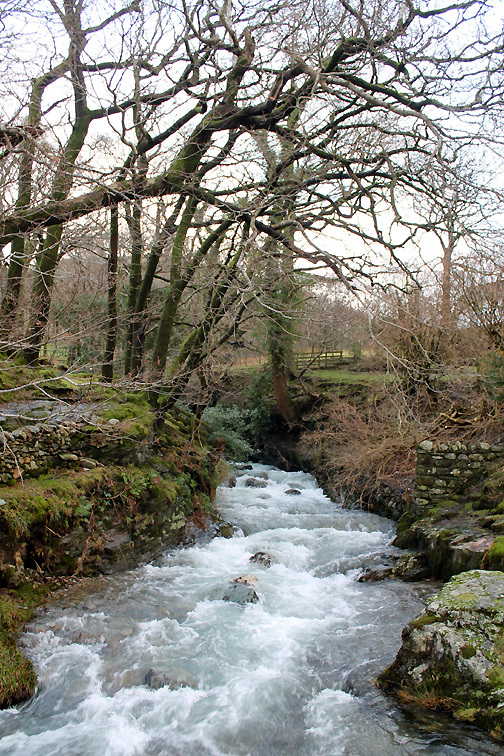 In fact it is too full for the river bed as it passes alongside the fields below the bridge. The large pool is a result of the lake breaching the gravel bank part way along the foreshore. 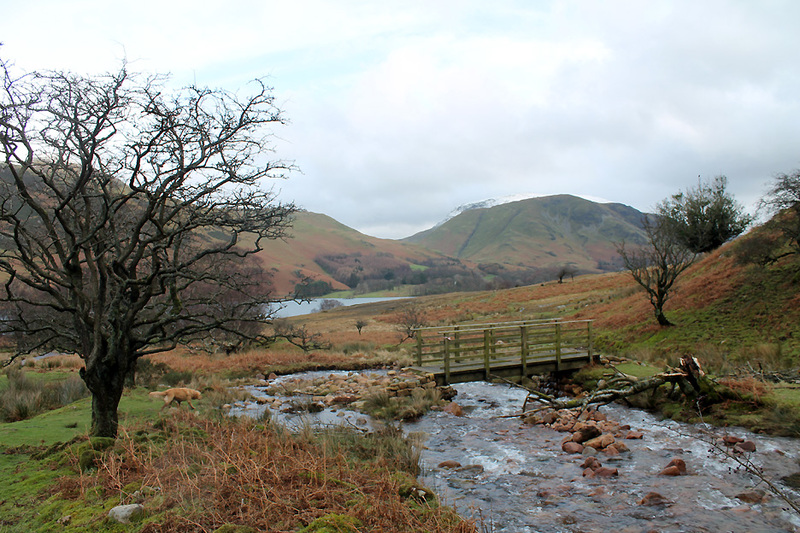 Looking back at Sour Milk Gill and the snowy High Stile summit. Back to the Fish Hotel . . . it always looks bigger from this side. and support the two lovely cafes in the village . . . perhaps you may be one of those people ? This site best viewed with . . .good waterproofing on the boots.